Baseball star Ryan Braun has gone overboard. Did his union give him the fateful push? Braun finally decided to cut a deal after he was listed as one of more than two dozen players who received “treatments” at the Biogenesis “anti-aging” clinic, run by non-doctor Anthony Bosch. Rather than wait for a suspension, amidst a disappointing injury-plagued season, Braun said no mas. He also didn’t put up a fight because perhaps the best fighting union in the country wouldn’t put up their gloves. There are certainly many who will cheer this development. Just don’t count me among them. My problem with the Braun case is that far too many people are applauding the union by setting up a false dichotomy: either the MLBPA will defend the small percentage of players who are found to be using PEDs, or it will disavow those found to be using and say that the role of the union is to help “clean up the game.” This is, frankly, twisted. The role of the baseball union, as forged by the late, great Marvin Miller, should be to safeguard the health of its players and entitle them to due process. Let Major League Baseball worry about public relations and kissing Congress’s behind so they can keep their anti-trust exemptions. That’s not a union’s job. When it comes to health, they should be fighting for expanded knowledge and education about what players put into their bodies. They should agitate for players to be able to use safe medical technology and incorporate it, as it develops, into a training regimen that makes player’s lives less perilous. They should also be fighting for accountability by ownership in baseball’s drug culture: constantly raising the question, “What do owners know about PED use on their teams?” They won’t win these battles, but that should be what’s raised from their bully pulpit. The current system only empowers shady—and medically dangerous—facilities like Biogenesis and individuals like Anthony Bosch. The union should also be fighting for due process and a system where the burden of proof is on the accuser and not the accused. Once again, it might not win these fights, but they get to the heart of what a union should actually be doing. As for Ryan Braun, he will go down as the first person sucked into the whirlpool of baseball’s sea change. If the union can’t throw a life preserver, it seems they could have done better than help throw him overboard. 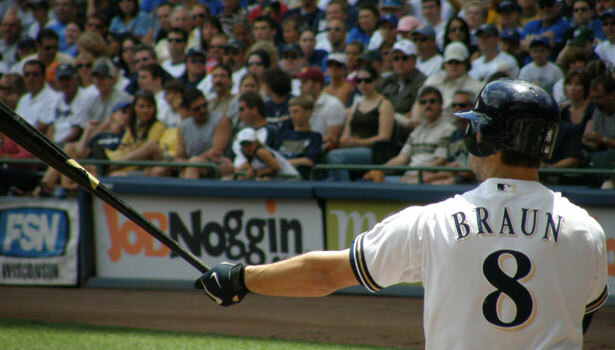 * No, Ryan Braun is not Major League Baseball’s version of Lance Armstrong. ESPN’s Buster Olney —and legions of others online—are comparing the Brewers slugger with the disgraced cyclist since, like Armstrong, Ryan Braun preceded his admittance of guilt with profoundly passionate statements of innocence. But Ryan Braun never tried to financially ruin any of the people who accused him. Ryan Braun never brought frivolous lawsuits or bullied fellow teammates into using in order to make them complicit. To use a labor parallel, Lance Armstrong was thuggish management and Ryan Braun is yet another worker caught up in the web of baseball’s steroid agonistes. Dave Zirin on the idiocy of the steroid hearings.